There are some pet parents who think that their dogs don’t necessarily need beds to be placed inside their crates as these contraptions prevent air from circulating through the bottom section of the crate. And if you have a dog that is very prone to overheating, you really don’t want this either. 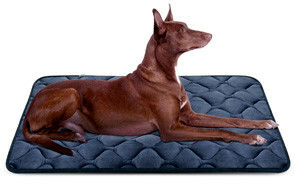 But for dogs that are more prone to cold, are skinny, have thin fur or are single-coated, the dog crate mat is a must. Besides, this type of doggie bedding is useful not only in your pet’s crate. As a matter of fact we can think of a thousand and one ways on how a dog crate mat can be used. However, learning the best dog crate mats should suffice for now. For those who are looking for a truly luxurious-looking dog crate mat that can be used not only in dog crates but in many other applications, too, the Midwest Homes for Pets’ Quiet Time Ombre Swirl Deluxe Bed is the perfect choice. With 11 different sizes to choose from, you’re guaranteed to have a bed that fits perfectly inside your current crate. The ombre swirl design of its lush polyester cover creates an almost-3D-like effect that, when coupled with its neutral color, can truly bring out the warmth in any interior décor. But the real deal is in how comfortable the Quiet Time is especially for your pet. It’s like pampering your beloved canine by giving its paws and body an ultra-soft surface to walk on and lay down. Since the Quiet Time also comes with non-skid back panel, you can use it on your floor or even in your car. It may cost you a couple or so of Alexander Hamilton bills, but if you’re looking at its softness, ease of maintenance, and durability, then it’s all worth it. 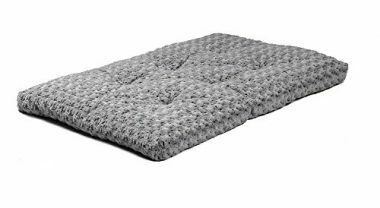 If you’re a fan of fleece, having used fleece blankets for your baby, then you’ll love the AmazonBasics Padded Pet Bolster Bed. 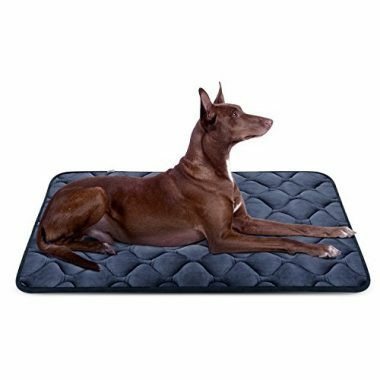 Under its cushiony polyester fill is a foam base made of 100% polypropylene giving your dog the sensation of lying on air, eliminating unnecessary pressure on joints and bones. It looks elegant, too, making for a great addition to any home furniture. It is no wonder many pet parents use it more as a standalone pet bed than a dog crate mat, although it can also be used in other applications such as in a car, at the picnic grounds, at the beach, or anywhere else. 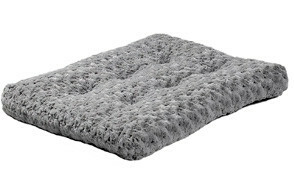 At the very least, you can be sure that your hound will be feeling all cozy and warm with the AmazonBasics Padded Pet Bolster hugging its body and allowing its head to comfortably rest on the bolster. The Bone Dry DII Pet Cage Mat is not really a dog crate mat in the strictest sense, although we’ve seen a number of pet parents using it as a comfy mat for their dogs to lie on. The Bone Dry is more of a super-absorbent mat that you slip under your dog’s crate or cage so you can actually remove the bottom pan of the crate if you wish to. However, we don’t really recommend that especially if you have a pet that is known to urinate quite voluminously. Its principal purpose, we believe, is to keep your dog crate in place as the Bone Dry comes with a non-skid back panel. It should also protect your floor surfaces against pet accidents and scratches from the crate. While it doesn’t provide any form of comfy cushion, your pet can still use it as its bed since the Bone Dry is extra-smooth, too. You’ll have to pay attention to its proper care though. 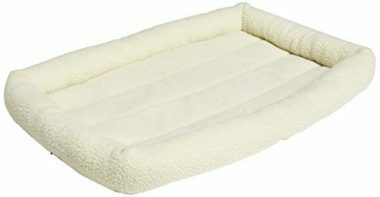 Just like the Quiet Time Ombre Swirl Deluxe, the Quiet Time Reversible Paw Print Pet Bed from MidWest Homes for Pets is an excellent choice for giving your pet a soothing and calming retreat right inside its crate. Priced lower than the Ombre Swirl, the Reversible Paw Print comes with polyfiber stuffing and given a plush-looking synthetic fur appeal. As its name suggests, the Paw Print is fully reversible so you get two contrasting designs in a single product. While it is designed specifically for dog crates it can also be used on a variety of other surfaces. However, the only issue is that it tends to move or go places when placed on slick or non-porous surfaces owing to the absence of a non-skid feature. Nevertheless, the mere fact that it’s almost half the price of the Ombre Swirl yet manages to come in as a really comfy mat for your pet makes the Paw Print a good dog crate mat to have. While it is the most expensive in our list, the Hero Dog Bed Mat Soft Fleece Crate Pad comes in with a very interesting feature that most other brands simply don’t have. Hero Dog is constructed of 100% microfiber giving it exceptional durability and strength to withstand scratching and biting; although we’re pretty sure if you’ve got a tenacious chewer, the Hero Dog will still be shredded to bits. It’s shed-resistant and requires very minimal maintenance, too. Of particular importance is the use of fleece which has been considered by many as the best for babies. Technically, the Hero Dog can be placed anywhere, not only in your dog’s crate. As such don’t be surprised if your baby will find sleeping on the Hero Dog beside your pet to be extremely comfortable. There’s a 3-centimeter thick cotton that cushions the body of your dog (or your baby, for that matter). It’s perfect for your car and can even serve as a furniture protector against pet hair and dander as well as loose dirt. With these features, we’d agree that the price is not really a big issue anymore. If you’re looking for a mat for your dog crate, you’ve definitely come to the right place. If our picks for the 5 best dog crate mats don’t suit your taste you can continue reading out buying guide to give you an idea on what to look for in the right dog crate mat as well as how to properly care for it. Of course, we also threw in something about why you need such a product and what benefits it can bring to you and your dog. As we have said in the beginning of this article there are pet parents who don’t see the need of dogs for having a mat inside their crate. This is perhaps especially true for those dogs living in warmer parts of the country or the world where putting a mat can block the flow of air circulating from under the crate or cage. This is understandable. However, there are also dogs that can benefit a lot from having a mat inside their crates. Here are some of the more important reasons why you should buy a crate mat for your pet. While it is perfectly okay for dogs to sleep on the metal ribbings of their crates, the individual bars can exert undue pressure on the body. If you happen to have a pooch that is quite skinny or has musculoskeletal or joint problems, this can be an issue. Providing a mattress for them to rest their bodies while inside their crates can help minimize the pressure so they’ll be able to retain the full functionality of their muscles and joints. This is especially true for senior dogs whose bodies may already be showing signs of advancing age. However, it is crucial to choose a dog crate mat that is designed as an orthopedic bed to help such hounds relieve pressure on their bodies, especially their bony prominences. Not all dogs are specially built for cold weather. Skinny dogs, canines with single or thin coats, and even dogs that are sick can benefit from the added warmth provided by a well-insulated dog crate mat. As we have noted earlier, one of the ‘drawbacks’ of using crate mats is that it blocks air circulation coming from the bottom of the crate. For dogs that have issues with overheating, blocking air circulation can be a problem. But for dogs that have issues regulating their temperatures when environmental temperatures drop, blocking the upward movement of cold air should help provide for better comfort. The good thing about dog crate mats is that they can also be used for other purposes. As you may have noticed in our selection, there are mats that can serve as furniture and car seat protectors. You can easily drape them over any surface that your dog will be lying down on to protect the surface from scratches, pet dander and fur, and even the occasional ‘accidents’ if your pet happens to be quite excited or overly anxious. However, it is important to look for a non-skid backing to secure the crate mat into place; otherwise, you won’t really get its full benefits. What Makes Up The Best Dog Crate Mats? Dog crate mats come in different sizes and thickness and can be constructed of different materials. Some can be adorned with details while others prefer to go for something simpler. While the choice of design of a dog crate mat is purely a matter of taste, there are certain things that will help differentiate a great dog crate mat from a mediocre one. A great dog crate mat should fit perfectly inside your dog crate. If it is larger you’ll have to curl up the sides just to make it fit. Unfortunately, doing so will diminish air flow through the crate. Too small and you will have certain sections that are not protected by the mat. It is, thus crucial to have the exact measurements of the interior dimensions of your dog crate so you can choose the perfect size. If you have a dog that is quite terrible when it comes to chewing you clearly don’t need a dog crate mat as even indestructible materials are no match for a tenacious chewer. However, if your pet is well-behaved then a dog crate mat should still be strong and durable enough to be used for several years. Remember, your dog may not chew on it, but it will still be sitting, lying, and walking on its surface. Its paws can easily damage the fabric material if the dog crate mat is not made of durable materials. What’s the use of a mat if there is no cushioning, even a few centimeters thick? While it is easy to pick one that is exceptionally thick, a more important parameter is the kind of stuffing used in the dog crate mat. Fiberfill is good, but if you have a dog with joint problems, dog crate mats with memory foam or orthopedic foam are better. All pet parents don’t want to go through the complicated process of cleaning and washing a dog mat. 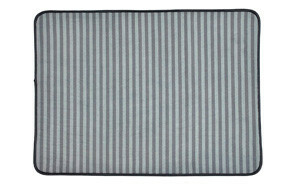 If it can be thrown into the washing machine or cleaned with a simple wipe of a moistened cloth, then that dog crate mat deserves your attention. 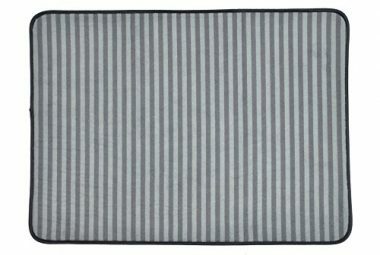 Different dog crate mat manufacturers have their own way of cleaning or washing their products. Some can be easily washed in a washing machine while others can only be washed by hand. Some will require washing with cold water before tumble-dried while there are those that require air-drying. The point here is to read the manual or the directions as to how you can properly clean your dog’s crate mat. If there are no specific directions on how it should be washed, you can adhere to the following tips. Always clean your dog mat after every ‘accident’. You can mix a solution of mild detergent and warm or hot water to clean the mat. Soak your dog crate mat in the solution for about an hour before cleaning it up. If there is odor you can sprinkle baking soda onto the mat, let it work its way into the fabric, and wash it after about 30 minutes or so. If your dog mat came with a cover this means you can remove the cover and wash it. Make sure to remove all hair, dander, dirt, or any other particle that may be present on the mat cover before washing it. Run your vacuum cleaner over the bed to remove all particles that may be stuck in the fabric material. While we already elucidated above why you may need to buy a dog crate mat for your pet, allow us to reinforce this by sharing with you the benefits of using a crate mat. These provide versatility and multipurpose functionality. They can be used not only as dog crate mats, but also as protective coverings for your furniture, car seat, floor, and crate covers. Dog crate mats provide your dog with exceptional comfort by allowing them to rest their tired bodies while fully secure inside their crates. They can easily sprawl out, assume the position they’re most comfortable with, and relax without being burdened by the metal bars on the floor of the crate. If your dog crate didn’t come with a bottom tray, having a crate mat can help minimize spills caused by pet ‘accidents’. These are easy to clean and maintain, too, as most are machine-washable. There are mats that come with fascinating designs so you can choose one that is perfect for your interior décor. While not all dogs will need a dog crate mat, it has been proven indispensable for those hounds that do need them. A dog crate mat should be of the right size, with ample cushion, easy to clean and maintain, and, above all, provide versatility in its use. Dog Crate Sizes: What Do I Need?